It is cold outside and the winter isn’t the most pleasant time of the year to take photos. That was my initial thought too, but starting this year my impression changed a lot and I found that the Christmas market is one of the best places to practice Street Photography. Street Photographers are often attracted by light and all the life on the street. The winter is scarce for both, but instead offers new views on the city. In Germany, we have a long tradition of Christmas markets serving hot spiced wine and other treats. It is places like these that make Street Photography a challenging but fun genre to me. Most Photographers are only found on the street photographing when the sun is shining and conditions are perfect. I previously voiced my opinion why it is helpful for aspiring photographers to seek difficult conditions instead of optimal and easy playgrounds. While I thought that darkness may be on the same level as rain or cloudiness, I found that the absence of light has a lot of advantages instead. In the summer I am highly dependable on the light and the ever-changing conditions. This means that on one day I wanted to focus more on stark contrasts and shadows while the sun is shining and on my way to downtown the sun is gone I am lost in a place of absolute dullness. Of course, I am able to adapt, but that was not what I was looking for in the first place so my motivation is depleting and I might not come home with the pictures I had in mind. The winter offers more security in terms of planning ahead. I know that in the afternoon it will be dark and no matter the circumstances it will be dark outside when I have time to photograph. This gives me the opportunity to plan ahead and focus on some places that I found interesting the other day. With the same constant light settings, you are able to take multiple opportunities for the same scene. Something that is normally not a feature of Street Photography. Did you know that for the very same reason James Cameron shot Terminator 1 in complete darkness? Without ever changing light you are able to focus more on the creative vision that goes into the photo. New Opportunities on Christmas Markets arise when you reach the technical limits of your camera. Of course, you can be on the lookout for natural light sources like street lamps or shop-windows, but if you want to be more mobile you need to carry the light with you. In terms of photography, this means, that the flash should be your loyal companion during the evening. At first, it sounds a little bit crazy to photograph with a flash in the night time. If you imagine using a flash, there are numerous worries that arise. From my experience, they are all insignificant. The biggest fear might be that you attract a lot more attention with a flash than without. While it is true, that you might be more conspicuous, people don’t react negatively. They are either too surprised or irritated that the tourist isn’t able to turn off the flash. I am more hesitant to use an off-camera flash in bright sunlight, because that is, in fact, more unusual, whereas it is logical in night photography. Using a mobile off-camera flash allows me to have full control over the immediate illumination of the photo. I am able to create my own setup like a studio photographer while having the choice of different backgrounds. Now we can combine those two things, the flash at night time with the visit to the Christmas market. The Christmas market is an ideal photo spot for me because it offers great light in the background while it allows me to be relatively inconspicuous. Christmas markets attract a lot of tourists and seeing the other photographers using a flash isn’t very rare. 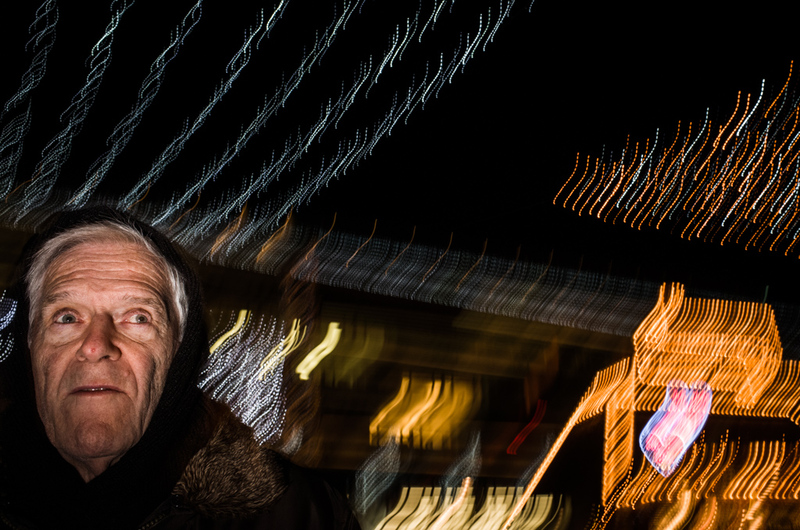 As a street photographer, you won’t stand out from the crowd just because you use your off-camera flash. Besides the great light, there is also a huge diversity of people. Whether it be locals that try to relax after a hard working week or tourists that come from far away. Anyone like a hot spiced wine in the cold and the atmosphere is great to capture some real intimate photos. For some ideas how to combine the flash and long exposure I already wrote an article giving some advice during the daytime. The dark isn’t different in a substantial way, but there are some more things you need to consider. While I found a shutter speed of about 1/20th of a second to work great during the day, we can get a little bit slower in the night. Personally, I go as low as 1/5th of a second to create surreal scenes. The most important feature you should look for is the light in the background. Without the light, you won’t be able to create any blurred and long-drawn-out light rays. Just using the flashing without any backlight will not benefit from the longer exposure, because if the background is dark it will stay like that. I list my personal favorite in the first place. This place has a great history and with the shopping stores nearby there is a great crowd to work with. Especially the KaDeWe is worth a visit, with its specially decorated shop-windows. Starting from the entrance there is artificial illumination above one’s head giving the possibility to make a great photo just because of the great light. While the Memorial Church is very traditional, the Alexanderplatz is in between modern architecture. The atmosphere is not as great, as there are trams crossing the place and it doesn’t really feel much like Christmas. There are a lot of booths that fit more to fun fairs than the winter time. Nonetheless, there are a lot of people around that give you the chance to practice your skills and capture a great moment. Probably pretty unknown in comparison to the Christmas markets mentioned before, the Christmas market in Spandau is a secret tip. Surrounded by historic buildings it offers a great flair. On the flip side this place isn’t very populated during the week and if you are looking for great pictures the evenings on the weekend are preferable.